Getting started on Pinterest can be daunting. You have your profile filled out, designed your Pin templates, and enabled Rich Pins. 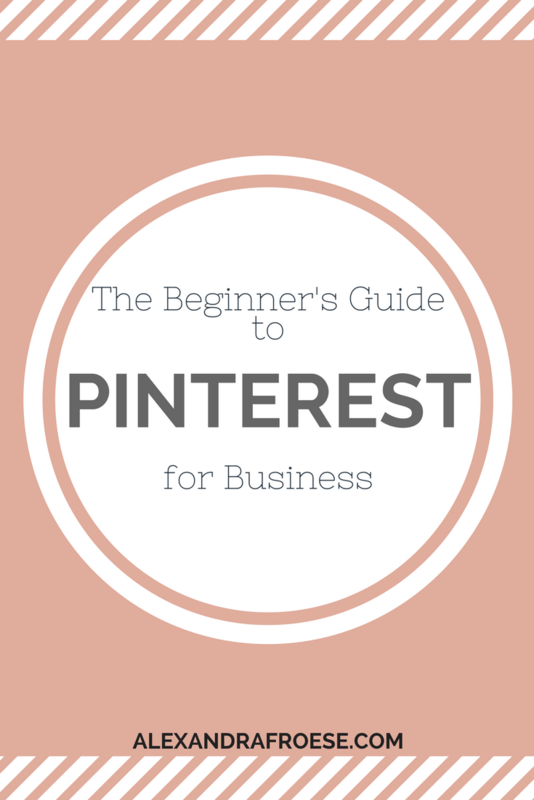 Now it’s time to start establishing your business’ presence on Pinterest! Start your Pinterest strategy off on the right foot! Snag this handy workbook to walk you through the steps to set up your biz on Pinterest the RIGHT way. The first step in filling out your account is to create some boards - I recommend creating at least 10 to start out with. You should create boards that are meaningful, helpful to your ideal reader, and at least somewhat related to your niche. For example - if you blog about homeschooling, having a board about quick and easy recipes may not be totally in your niche, but chances are those busy parents of homeschooled kids are going to be interested in those recipes as well! The one board that every account needs is a board for your original content (blog posts, products, etc). This board will be for your own pins only. This board will be for your own pins only! Name this board something simple, like your business name or domain name. My board is named "Alexandra Froese Social Media". When creating boards, remember to incorporate keywords throughout the titles and descriptions. Check out my post here on finding the best keywords for your brand. Custom board covers were pretty popular at one point, but have fallen into disuse lately. They aren’t really that important - it’s purely for looks. If you want to create board covers, go for it! But don’t spend too much time worrying about them. At the top of your profile, you’ll have something called a Board Slider. This is where you can showcase a few of your boards to anyone that views your profile page. Choose the boards that are the most relevant to your niche (or your most popular boards). After creating your boards, it’s time to fill them with some content! I recommend pinning around 25-30 pins per board. This will ensure that your boards don’t look empty and neglected. Make sure you’re choosing pins that fit your board’s theme and are well-made. These pins are more likely to be re-pinned by others, boosting your "rank" in Pinterest's eyes - if Pinterest thinks you post good stuff, it's more likely to show your pins! Double check that the pins actually link to the content they claim to - most pins these days are “watermarked”, or have the pin creator’s website somewhere on the pin; make sure the link below the pin is the same! When pinning your own content, it's important to make sure that your pins are high quality. Learn how to make eye-catching Pin Images here. Your descriptions and titles need to have well-researched, good-quality keywords as well. These are pulled from your website or blog (as long as you have Rich Pins enabled). If you’re a new blogger and/or you don’t have much pinnable content yet, start out with pinning a ratio of 80% other people’s content, and 20% of your own content. (For every 4 pins of someone else’s content, pin 1 of your own). This may seem counterintuitive since you’re effectively promoting other people’s content more than your own, but you need to “teach” Pinterest’s algorithm that you pin good quality, clickable stuff. Once you’re more established, you can up that ratio to 50/50. If you don’t have a lot of your own content to pin, I suggest starting with 5-10 pins per day. As you grow, increase the number of pins to 20-30/day. I don't recommend pinning more than 50 pins per day. There's no need to exhaust yourself! You can use a scheduler like Tailwind or Boardbooster to schedule many of your pins, but make sure you're also doing some manual/live pinning. If you're just scheduling pins and not actually taking the time to open Pinterest, you could miss out on seeing what's being pinned or what's popular. While pinning to your own boards is important, you'll also want to join group boards and/or Tribes (Tailwind-specific). A group board is a Pinterest board with multiple different people pinning to it. Group Boards are a great way to get your content out into the world! I recommend joining no more than 5 group boards/Tribes as you're getting started. Any more and it might get hard to keep track! Each board or Tribe has its own rules for membership that must be followed or you risk getting kicked out. I'll share more on how to choose a group board and specific strategies in another post! Following these strategies will ensure that your business has the right foundation to grow and flourish on Pinterest. I recommend following anywhere from 50-200 accounts and boards to start out with. It may seem like a lot, but following these people (and boards) will give you a ton of relevant content to choose from in your feed, and some of these people may just follow you back! Use the Pinterest search bar and enter in some of your keywords. You can filter your search by "People" or "Boards" at the top of the page - either works - and choose a bunch to follow. You can also find group boards with this method, so keep track of the boards you might want to join! There are also many Facebook groups that have a weekly "Social Media Follow" thread. Hop into those groups (on the appropriate days!) and drop your Pinterest link along with a brief description of what type of things you pin. This is a great way to get a few new followers and find other accounts to follow. If you follow the directions above, your account should be in tip-top shape and ready to promote your content. Go watch those numbers grow! Need some extra help? I designed a free workbook to help you out. As a busy entrepreneur, you may not have the time (or energy!) to implement all of these strategies. Instead of skimping on content - which could have big repercussions for your biz - click here to learn more about booking a Pinterest Account Setup package.